You lean in to whisper a secret to your friend and see their face frown up. Uh-oh! Your breath isn’t it’s freshest. We’ve all been there! It’s embarrassing and can a negative effect on your quality of life if you seem to have chronic bad breath. Not only can it be embarrassing, but it can also be a warning sign of more serious health issues. 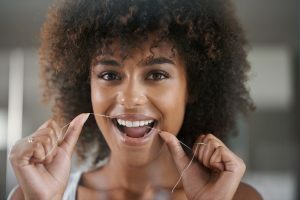 Your dentist in Cookville believes that if you understand the causes of bad breath and how to fight it, you can quickly get your mouth back to feeling as good as new! Here are a few causes of bad breath and some tips to help eliminate this pesky problem. We all know that if you skip parts of your dental hygiene routine, your smile will become weaker but it is also a main cause of bad breath. When food particles remain on the surfaces and crevices of your mouth, the bacteria that then forms carries a bad odor. Harmful bacteria can get trapped on the surface of your tongue, between teeth, at the gum line, and on and between dental prosthetics. Chronic dry mouth can also cause bad smelling breath. Since one of saliva’s purposes is to clean your mouth, a decrease in saliva means particles and bacteria can be left behind. Aside from dry mouth syndrome, this can also be caused by certain medications, drinking alcohol or smoking, and even snoring. Sleeping with your mouth open also tends to dry out the mouth. Not limited to smoking, any use of tobacco can lead to bad breath. Oral tobacco can leave particles on the mouth’s surface just like cigarettes. Also, the scent of cigarette smoke can stay in the lungs for several hours, making the breath stale. Tobacco also dries out the palate and contributes to tooth decay and gum disease, again, causing unpleasant breath. Also called gum disease, periodontal disease can have serious health consequences, including the loss of teeth. Bad breath can be an early sign of this disease. Bacteria in plaque builds up in the early stages of gum disease, resulting in odorous breath. The condition can have a number of causes, but if left untreated, the small spaces between teeth and gums can become infected. Toxins then break down bone and connective tissue, leading to tooth loss. Bad breath shouldn’t ever be debilitating or permanent. There are a number of things you can do to keep your mouth smelling fresh. (And if you are having chronic bad breath, that could be a sign of serious dental issues). Brushing twice daily (along with your tongue) with fluoride toothpaste followed by flossing will help remove the odor-causing dental bacteria. To keep that saliva flowing, you can also chew sugarless gum. If you use tobacco, quitting will go a long way to improving your breath. One of the best ways to handle bad breath is by visiting your dentist regularly. Along with routine oral exams and thorough professional teeth cleanings, we have services to help patients with serious dental problems that may be causing your bad breath. Unpleasant breath does not have to control your life! Contact us today to schedule your next appointment.